Jake Trapper Just CRUSHED Huge Wave! When Jake Tapper even admits on CNN there is NO Blue Wave…. President Donald Trump has given his endorsement to 79 gubernatorial, House and Senate Republican candidates on the ballot Tuesday and stumped for many of them in their home states. The president is currently three-for-three in the House after outlets called races for Florida Republican Reps. Ted Yoho, Matt Gaetz and Neal Dunn. All three are incumbents. But two of his Senate picks have gone down. Ohio Senate hopeful Republican Jim Renacci lost to Democratic incumbent Sen. Sherrod Brown, and Pennsylvania Republican Senate hopeful Lou Barletta lost to Democratic incumbent Sen. Bob Casey. Republican Gov. Asa Hutchinson has earned re-election and is the only Trump gubernatorial endorsee with a race that’s been called. Here’s a list of the candidates he has endorsed and whether voters ultimately decided they were the right choice. Close races to watch include Republican Georgia gubernatorial candidate Brian Kemp, who is neck and neck with Oprah Winfrey-endorsed Democrat Stacey Abrams, and Democratic incumbent Missouri Sen. Claire McCaskill’s close race with Republican challenger Josh Hawley. Trump endorsed 18 candidates for governor who were on the ballot Tuesday, five of whom are incumbents. It’s worth noting that Trump also endorsed Wyoming gubernatorial candidate Foster Friess in August, but Friess lost in the primaries to Wyoming State Treasurer Mark Gordon. Kansas gubernatorial candidate Kris Kobach also received attention after Trump endorsed the challenger over GOP incumbent Gov. Jeff Colyer in August. Kobach is in a toss-up race with Democrat Laura Kelly, according to RealClearPolitics. No results have been finalized. Trump endorsed 20 senatorial candidates who were on the ballot Tuesday, including six incumbents. So far, one of those challengers, Renacci, failed to secure a victory. Trump also endorsed West Virginia Republican Rep. Evan Jenkins before Jenkins lost to state Attorney General Patrick Morrisey by roughly 5 points, according to Ballotpedia. 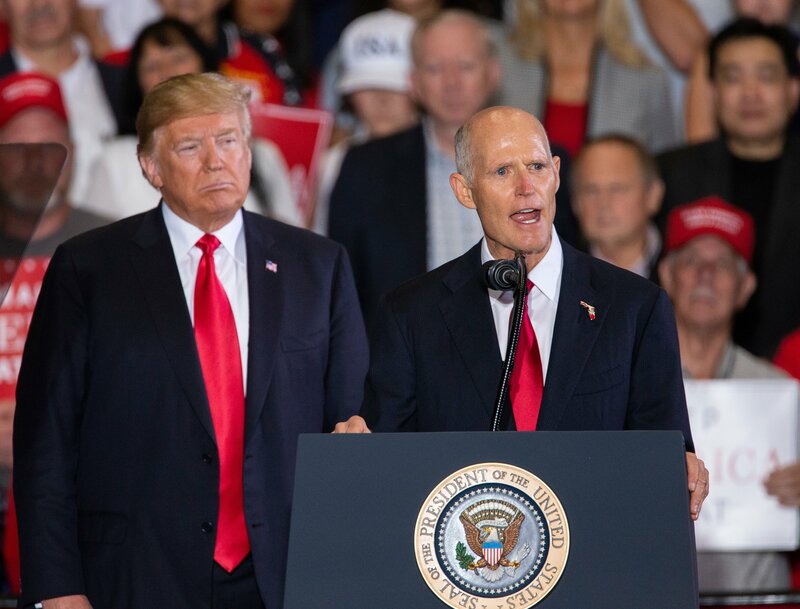 Trump touted candidates in tight races, like Senate hopefuls Florida Gov. Rick Scott and Tennessee Rep. Marsha Blackburn at rallies in their home states in the days leading up to the election. Trump endorsed 41 House candidates, including 28 incumbents. So far, the only results in for a Trump endorsee are Florida Republican Rep. Yoho’s victory. Trump endorsees facing tough races include Virginia Rep. Dave Brat, who’s in a toss-up with Democratic challenger and former CIA officer Abigail Spanberger, and Ohio Rep. Troy Balderson, who is once again facing Democrat Danny O’Connor after beating him in an August special election. This post is developing and will be updated. Disclosure: Friess has donated to The Daily Caller News Foundation in the past.